Clarets boss Sean Dyche has backed striker Danny Ings to regain his scoring touch. But he knows it is not all about one man – Burnley have to be more ruthless in their remaining six gamnes if they are to stay in the Premier League. Ahead of Saturday’s trip to Everton, Ings – Burnley’s top-scorer with nine – has gone seven games without a goal, his longest drought of the season. He started the season without a goal in six, but he ended that dry spell with his first-ever Premier League goal – against the Toffees at Turf Moor. Ings, the subject of more unfounded speculation this week, is often his own biggest critic, and hasn’t appeared his normal exuberant self on the pitch of late. And Dyche said: “You want players to have an emotional connection to what they do, and Ingsy certainly has that. “I’ve spoken about wanting him to play with a smile on his face, as that is when he is at his most potent. “Most goalscorers know that when they are flowing, they are enjoying their football, but when it’s not happening, the reality is it can be tough. “Ingsy is conscientious and wants to do well, and he has shown he can score goals at this level. It’s not about one player though, it’s about the way the team operates. Dyche added: “We have to continue to create, and create more and better chances, but we have to take them. To that end, Kieran Trippier has fired over more crosses than any other player in the Premier League since the turn of the year, but Dyche underlined: “It’s not just about the quantity, it’s about quality, putting the ball in key areas more often. Burnley will also have to improve on their tally of away wins, with the success in November at Stoke, courtesy of an Ings brace, their only victory on the road. 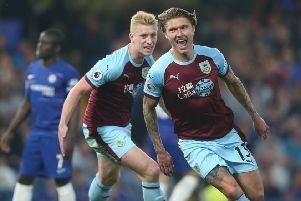 The Clarets have taken points at Chelsea and Manchester City, and performances have been a far cry from Burnley’s last season at this level when they only claimed four away points, but Dyche said: “We’ve certainly been in the vast majority of our away games, which is a marker in itself at this level, but we want to add to the performances and turn the draws into wins. “But Everton is another tough game. They’ve come out of a sticky period and I’m sure they are safe now. “The reality of the Premier League is teams are clinical at both ends of the pitch, and we need to get the balance right, which is the biggest challenge.